Horleys - Low Carb Protein Bars with Crunch for Smart Snacking. The perfect mid morning or mid afternoon snack. Because these are low in carbohydrates, we don't recommend you use them either directly before or after exercise - Protein 33 Bars are more suitable as workout or sports fuel. Please note: due to the fibre and polyol content, excess consumption of Carb Less Crunch Bars may have a laxative effect - our suggested maximum intake is two bars per day. All flavours contain SOY, MILK products and PEANUTS. No ingredients contain gluten but bars are made on equipment also used to manufacture products containing tree nuts, sesame seeds and cereals containing gluten. *We don't use any ingredients that contain gluten in our Carb Less Crunch bar recipes. The manufacturing line does also make some products with gluten in them - the chance of cross contamination is very remote however it is not zero. Please contact us if you would like any further information or reassurance on our testing procedures. 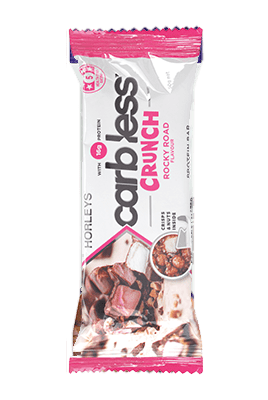 Horleys Carb Less Crunch bars use ingredients such as maltitol and polydextrose, which have minimal impact on blood sugars and insulin response. While they are still metabolised as nutrients, they have a relatively low calorific value compared to sugars and other carbohydrates. The total calorie count includes them. Find out more about these low carb ingredients here. These bars are a deliciously crunchy alternative to our original nougat-style Carb Less bars. They are the perfect bar to complement a smart eating plan that includes a reduced carbohydrate intake. A great snack to fill you up (not weigh you down) and the ideal sweet but satisfying treat with a cup of tea or coffee!